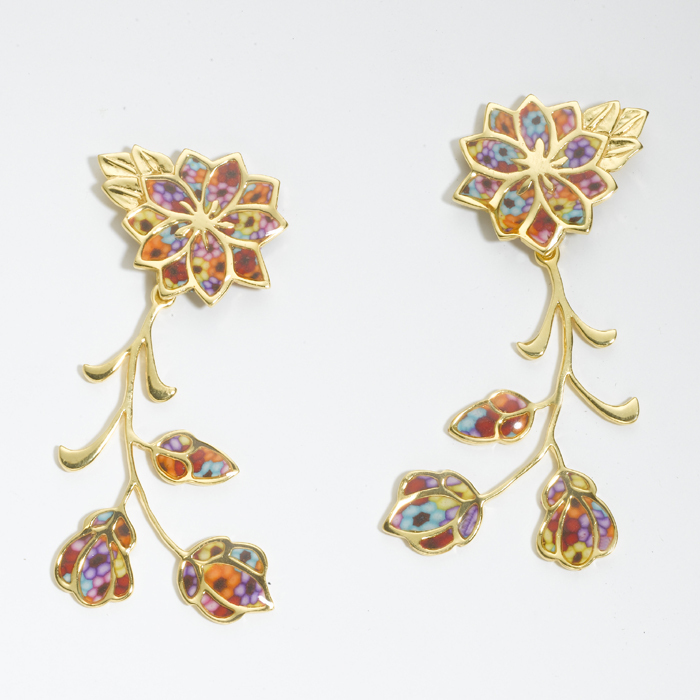 A floral earring set made from one large open flower and three smaller closed ones hanging below on a gold base. Frida means 'Joy' in Yiddish. These stunning, impressive earrings, where blooming flowers and delicate flower buds in their leaves made with the 'Millefiori' technique are set into gold plated sterling silver jewelry, are sure to bring joy to the wearer. The talented artists of Adina Plastelina have reused the 2000 year old technique of Millefiori (literally - thousands of flowers) which is used here to literally create a background of a myriad of flowers to give the shape even more life and presence. This lovely set of earrings was created on a Gold base, and filled with a hand made 'Millefori' thousand flowers pattern.